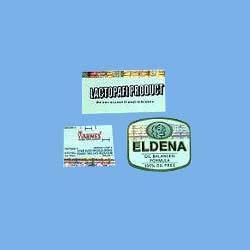 Driven with excellence, we are engaged in offering a wide range Combination Paper Labels With Holograms. In order to execute our manufacturing process, our team take help of the most advanced machineries that comply with the current market trends. Besides, our range encompasses, Hologram Seals And Wads,Industrial Hologram and Holo Shrink Sleeves and Labels. Responding to clients' variegated demands, our range is provided also customized specifications at the market leading price. We make Printed or unprinted Bar Code labels with security Holograms strips applied on them. If deired The Hologram strips can be made as per custom design of the clients. Availability as per requirements of the wide number of clients have inspired us to come out with a more reliable and efficient range of Combination Paper With Holograms that suits their demands. Along with this, flawlessness of our range is checked through some stringent test by our team.